A former England and British & Irish Lions international, Beaumont is currently chairman of the Rugby Football Union having previously served as vice-chairman of the International Rugby Board and a member of the IRB Council and IRB Executive Committee. Beaumont rose to prominence as a lock for Lancashire-based side Fylde and made his international debut for England as a replacement against Ireland in 1975 - aged just 22. He succeeded Roger Uttley as England captain in 1978 and later led the North of England to victory over the touring All Blacks in 1979. He went on to earn a total of 34 Test caps for England - captaining his country on 21 of those occasions and most famously leading them to the 1980 Five Nations Grand Slam - their first clean sweep since 1957. The Preston-born second-row also captained the British & Irish Lions on their tour of South Africa in 1980, having featured as a replacement on the tour of New Zealand in 1977, making him the first English skipper of the side since Douglas Prentice in 1930. But the Lions slipped to a 3-0 series defeat in South Africa with their only success being a 17-13 victory in the last Test in Pretoria. Injury curtailed Beaumont's career in 1982 but he went on to find further fame as a captain on the popular BBC TV quiz show A Question of Sport, a role he occupied while juggling his commitments as managing director of his family's textile business. 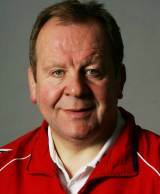 Beaumont, an honorary president of the Wooden Spoon charity, was involved with the Lions once again in 2005 when he served as team manager for the troubled tour to New Zealand. An England's representative on the IRB Council for several years, Beaumont was elected to the position of vice-chairman in 2007 following the promotion of Bernard Lapasset to the top job. He challenged Lapasset for the chairmanship four years later but lost the vote and also his position as vice chairman to South Africa Rugby Union boss Oregan Hoskins. Awarded an OBE in the Queen's 2008 birthday honours, he was elected the chairman of the RFU in 2012.